Terry Johnson's comedy comes to the Vaudeville Theatre London in a brand new production of Dead Funny, starring Katherine Parkinson and Ralf Little. Last seen in 1994, this production marks the 21st anniversary of the play, which originally starred Zoe Wanamaker and David Haig. Opening in the West End in November, Dead Funny is set to run until early February. Dead Funny is the rip-roaring comedy that follows Eleanor, who is desperate for a baby and her husband Richard, who runs the Dead Funny Society. Every time a comedy hero dies, the society gathers together to celebrate their lives. When Frankie Howard and Benny Hill turn up their toes in the same week, it seems that Eleanor's request to widen the family have to take a back seat. And when your own marriage is turning into a comedy of its own, it becomes difficult to see the funny side of things. Katherine Parkinson (The IT Crowd, Humans) stars as Eleanor, opposite Steve Pemberton (Benidorm) as Brian, Ralf Little (Two Pints of Lager and a Packet of Crisps) as Nick. Further casting includes Emily Berrington as Lisa and Rufus Jones as Richard. Directed by the Olivier Award-winning Terry Johnson, Dead Funny features design by Richard Kent, lighting design by Paul Pyant and sound design by John Leonard. Johnson had recent West End success with the musical adaptation of Mrs Henderson Presents. 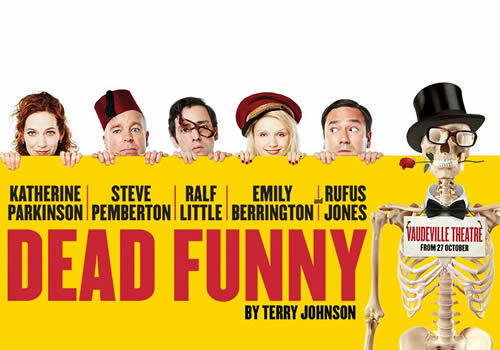 Opening for a limited season at London's Vaudeville Theatre, Dead Funny begins previews October 27th and runs until February 4th 2017. Dead Funny contains strong language and scenes of a sexual nature. It is therefore recommended for those aged 15 and above.